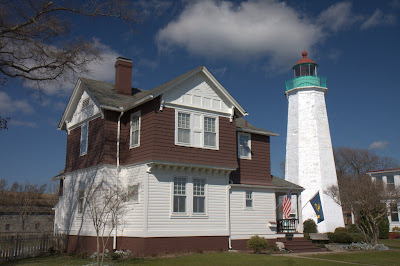 Old Point Comfort Light is located on the grounds of Fort Monroe on the Chesapeake Bay in Virginia. Completed in 1803, it is the second oldest light in the bay and the oldest still in use. The Queen Anne Victorian keeper's house was completed in 1891 and is still used by the fort as officer quarters. The lighthouse overlooked the legendary battle in 1862 of the first ironclads, the USS Monitor and the CSS Virginia. Following the Civil War, Confederate President Jefferson Davis was imprisoned in one of the fort's casemates (an artillery room) behind the lighthouse and the fort's famous moat. Canon 40D, 1/40s, f/22.0, ISO 100, Canon 17-55mm f/2.8 zoomed to 23mm.